Gael Garcia Bernal stars in this film about the Bolivian Water War, based on a screenplay by Paul Laverty. Obsessive idealist Sebastián has sworn to direct a film about one of the world’s most iconic figures, Christopher Columbus. He is determined to overturn the myth of the arrival of Western Civilization in the Americas as a force for good. His film will show what Columbus set in motion: the obsession with gold, the taking of slaves, and the terrible violence visited on those Indians who fought back. The brilliant actor playing Columbus constantly challenges the director, accusing him of hypocrisy and cheap manipulation. Costa, Sebastián’s friend and producer, doesn’t give a damn. All that matters is that the film comes in on time and within budget. 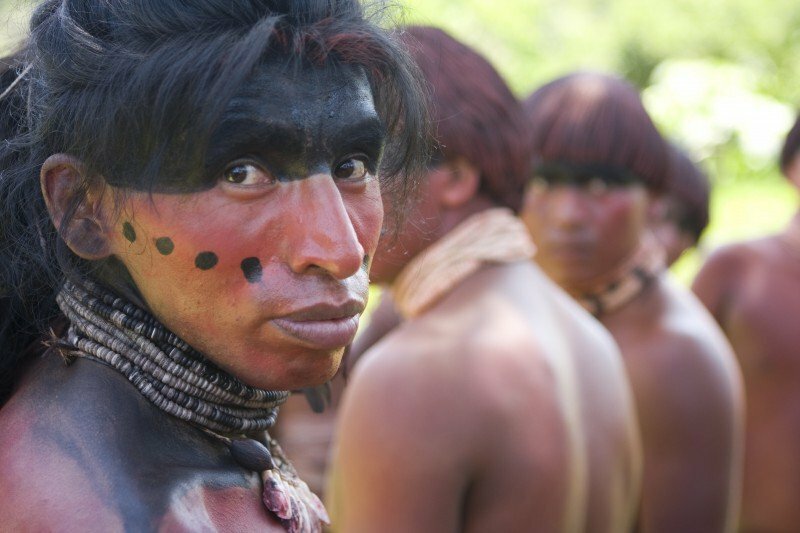 Costa decided they will shoot in Bolivia, the cheapest, most “Indian” of Latin American countries. While the shoot progresses in and around the city of Cochabamba, civil and political unrest simmer, as the entire water supply of the city is privatized and sold to a British/American multinational. Violence increases daily until the entire city explodes in the now infamous Bolivian Water War - a war which actually took place in April 2000. 500 years after Columbus, sticks and stones once again confront the high-tech weaponry of a modern army. David against Goliath. Only this time the fight is not over gold, but the simplest of life-giving elements - water. Icíar Bollaín was born in Madrid in 1967. Her interest in cinema can be traced back to her teenage years and her roles in films such as Victor Erice’s “El Sur” (The South) and Manuel Gutierrez Aragon’s “Malaventura” (Misadventure). She subsequently appeared in “Tocando Fondo”, directed by José Luis Cuerda,“Tierra y Libertad” (Land and Freedom), by Ken Loach, and Jose Luis Borau’s “Niño Nadie” (1997) and “Leo” (2000), for which she was nominated for the Goya for Best Actress. She made her debut as a director in 1995 with “¿Hola, estas sola?” (Hi, Are You Alone?) at the Valladolid Film Festival, where she won the Best New Director award. She subsequently directed “Flores de otro mundo” (Flowers from Another World) (1999), Amores que matan (2000) and “Te doy mis ojos” (Take My Eyes) (2003) – for which she won seven Goyas, including Best Director, Best Original Screenplay and Best Film. Her most recent film as director, “Mataharis” (2007), received two Goya nominations. "Even The Rain is clever, warm and compelling, and kept me thinking long after I departed the cinema." "Scores points for stylistic ambition and its heartfelt sympathies towards the dispossessed." "With each new Laverty script there is renewed hope that cinema can achieve its lofty ideals."